With the recent ticket increase and upcharges introduced at Walt Disney World, it seems more expensive than ever to hop between Magic Kingdom and Epcot or be among the first to experience Animal Kingdom at night. Guests can actually meet Mickey Mouse, slurp on a Dole Whip float and even watch all three evening fireworks shows without having to purchase admission. The main thing you’ll miss out on are the attractions—and don’t worry, we won’t try to convince you that the monorail is just a slow rollercoaster—but everything from tasty treats to take-home trinkets are available throughout Walt Disney World, no ticket required. 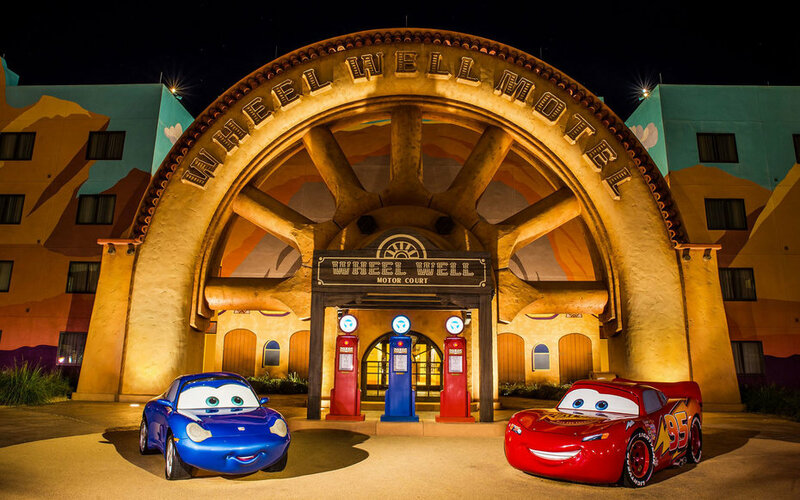 At Disney’s Art of Animation resort, non-guests are free to wander the grounds and dive into their Instagram-worthy re-creation of Radiator Springs from the movie Cars, as well as revel in the oversized depiction of characters from The Lion King, The Little Mermaid and Finding Nemo. Families can also take in live entertainment free-of-charge outside Disney’s BoardWalk Inn and walk the hotel grounds at Animal Kingdom Lodge’s Jambo House and Kidani Village to get up close to majestic animals like zebras, giraffes, gazelles, ostriches and flamingos, all without spending a cent. Mickey Bars and Mickey-shaped ice cream sandwiches are available in nearly every non-park location in Walt Disney World, from quick-service restaurants at resorts to ice cream stands at Disney Springs. Other famed treats, like candy-covered apples and dipped marshmallows can be found at both resorts and Disney Springs, particularly at Goofy’s Candy Company and Candy Cauldron. It’s not a proper afternoon at the Magic Kingdom without waiting in the Adventureland line to devour Dole Whip, but at the Polynesian Village Resort’s Pineapple Lanai, you can easily grab a cone or float with ease — and, of course, no admission fee. Believe it or not, you don’t need park tickets to get face-to-face with Mickey, Mary Poppins and even Stitch—but you will need a restaurant reservation. Character dining is available at five Walt Disney World resort hotels, as well as Ravello at the Four Seasons Resort Orlando and Garden Grove at Walt Disney World Swan hotel. The only way to meet a princess outside the parks is at the Grand Floridian Resort & Spa, by either dining at 1900 Park Fare or attending a Princess Party in the Garden View Tea Room. You don’t have to be inside the Magic Kingdom to boost your pin collection, as staff throughout Walt Disney World property, both at resorts and at shops, have books, boards and tradeable pins on their lanyards. In fact, two of the best swapping opportunities happen while most guests are busy in the parks. The massive board at Disney’s Pin Traders in Disney Springs is easily Walt Disney World’s biggest and best, but only opens during select times throughout the day. King Pin, a legendary trader who visits Disney’s Animal Kingdom Lodge hotel, also hosts afternoon trades throughout the week — two major perks for those who aren’t spending their day on rides. It’s not just that World of Disney at Disney Springs is better than every gift shop at the parks — it’s so massive, it carries items you may not have ever found there. If you’re cutting costs, there are also official Disney outlet stores at the Orlando Premium Outlets nearby, which are perfect for loading up on any Mickey ears or trinkets for loved ones back home without breaking the bank. Some of the best immersive dining experiences are actually outside of the parks. The Spirit of Aloha Dinner Show at the Polynesian Village Resort has guests dine on pulled pork, pineapple-coconut bread and their signature bread pudding while enjoying a luau complete with fire dancing and a spectacular fire-knife performance. Over at Fort Wilderness campgrounds, the Hoop-De-Doo Revue is an interactive music-and-comedy show whose country-style aesthetic is served up alongside the very best fried chicken Disney has to offer. The fourth-floor terrace at the Contemporary Resort is an easy-to-get-to viewing point, but the prime spot to watch fireworks for free is at the Polynesian Village Resort. You’ll get a better view than being crammed on Main Street, the hotel plays the show soundtrack on the speakers and if you arrive early to grab a spot, you’ll even catch the Electric Water Pageant. If you want to step it up a notch, make a reservation at Capa at the Four Seasons Resort Orlando and prepare for a magical evening you could never replicate in-park. Eat tapas while taking in the evening fireworks performances at Magic Kingdom, Epcot and Hollywood Studios—an unbelievable trifecta that is truly one-of-a-kind.